Permit are probably the most sought after gamefish off the passes and wrecks surrounding Anna Maria Island. Captain Tom Chaya has had good success on getting his clients hooked on monster permit. 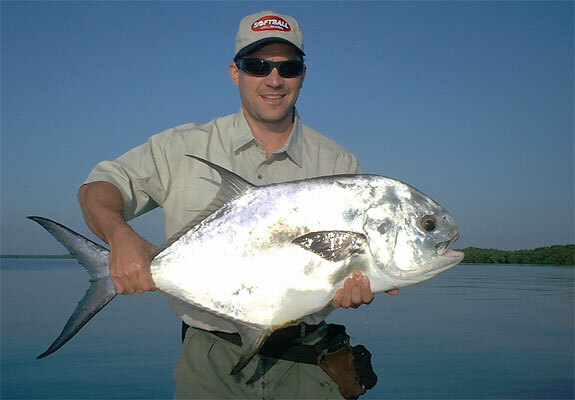 Permit rates as one of the very best sportfish with long runs on the flats and strong, stubborn deep fighters on the offshore wrecks. Although offshore Permit are large enough to provide sport with medium tackle the epitome is to sight fish for them around sandbars near Egmont and passage keys. Best natural baits are any size of small crab. Dead crab or sandfleas also work well. Live shrimp are often acceptable,especially if skittered across the surface and then allowed to sink. If using small skimmer jigs, try to get the Permit to follow the lure, then stop it dead and let it sink to the sand or grass. Best flies are those weighted or epoxy heads that will sink in the manner of a leadheaded jig. The size can run as high as 40-50 pounds with 20-30 pounders fairly common. The Florida record is 56 pounds 2 ounces. Small permit also similar to pompano. The permit has a deeper body and blunted head than the pompano. Large sickle tail. Scutes absent and most silver overall with sometimes a black blotch on the side under the pectoral fin. Both fish do provide the absolute best in tablefare.